The recommendations are made to the four organizations that have representatives to the Coalition. Once those organizations respond, the Coalition will share the responses and next steps, which will include a formal set of recommendations to City officials. Which option or variation is recommended, you ask? It’s the Triangle option, for a number of reasons, detailed in the Coalition’s report and recommendations. It’s important to emphasize, though, that the recommendations include corollary and complimentary development along Harrison Avenue throughout the neighborhood’s historic business district and on the grounds of Westwood Town Hall. We hope that you will read the full report for the context and the details. (It’s only four pages long.) Please offer any comments here or via revitalizewestwood@gmail.com or to any of the four organizations. 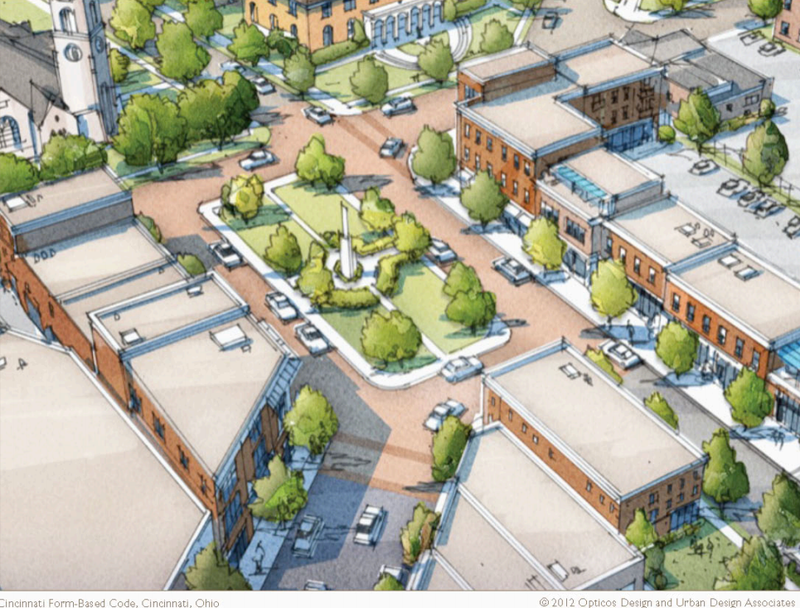 Here is the presentation (link below) from the June 12 Westwood Coalition’s community meeting about the Westwood Square. Notes to follow. The presentation is a report by Cincinnati’s Department of Transportation & Engineering on its Westwood Square feasibility study. It was prepared and presented by Martha Kelly and Jeff Stine of DOTE. Initial slides about the process preceding the June 12 meeting and the community’s criteria were presented by the Coalition. Comments on the Westwood Square options are welcomed. Please comment on the website or email revitalizewestwood @ gmail.com. Square, triangle, rectangle, circle — we won’t know the final shape or size until a couple of things happen. First, the Westwood Coalition invites you to a community meeting on Thursday, June 12, 2014 at 7:00 p.m. in Westwood School’s auditorium (2981 Montana Avenue, at Harrison & Montana – enter on the side facing Westwood First Presbyterian Church). We will review the criteria for the Square (or triangle or circle…), already identified through neighborhood design charrettes and community meetings over the past few years, and then look at and provide input on several iterations of the Square as part of Cincinnati Department of Transportation & Engineering’s feasibility study. Attendees will consider the criteria and apply them to each of the draft versions, providing comments and asking questions. See you on June 12! There is limited parking on site, with more parking on surrounding streets and Metro bus service.